DOES INTERNET MUSIC MEAN THE END OF CD? 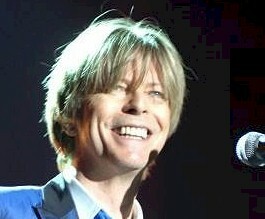 Veteran pop star David Bowie has become the first major name to launch an album on the Internet. The singer's 23rd album "Hours" became available on the Internet in the autumn of 1999. American users could download and keep their own copy. Because of copyright laws, his British fans were not allowed to save the 10 tracks on their computers. Even so, fans were able to listen to all the songs before the CD was available in shops. By visiting a special web-ring (linked Internet sites) fans could hear a song at each site. Bowie has been a keen supporter of Internet music releases for a long time. Two years ago his drum and bass single Telling Lies was only available on the Web. "I hope that this small step will lead to greater steps by me and others," said Bowie at the time. He hoped it would give fans "greater musical choice and easier access to the music they enjoy." The 60-year-old star thinks that his pioneering project will encourage others in the music industry to explore the potential of the Web. Record companies have been wary of using the Internet to distribute music. They fear that illegal copying will damage their profits. However the US release of "Hours" used a new safe computer system. This ensured that once a customer paid for an internet version of the album no duplicate copies could be made from it. Does this mean the end of the CD? Well, not just yet. Even "Hours" was released onto CD. But the day will come when a major figure like Bowie releases an entire album only onto the internet. On that day the CD will move a step closer to joining its vinyl ancestor, the LP.